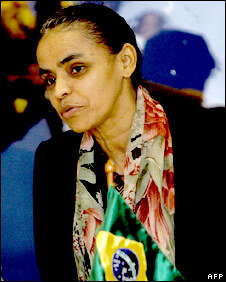 Brazil's Environment Minister, Marina Silva, a staunch defender of the Amazon rainforest, has resigned from her post. In a resignation letter to President Luiz Inacio Lula da Silva she said the move was "personal and irrevocable". She also referred to difficulties she had faced "for some time" in implementing the government's environmental agenda. Environmental campaigners say her resignation is a major setback for the rainforest in Brazil. "Brazil is losing the only voice in the government that spoke out for the environment," said Sergio Leitao, director of public policy for Greenpeace in Brazil. "The minister is leaving because the pressure on her for taking the measures she took against deforestation has become unbearable," he added. Marina Silva has blamed the increasing deforestation of the Amazon on Brazilian cattle ranchers and farmers. She had unsuccessfully opposed several government infrastructure projects in the Amazon rainforest, including two big hydroelectric dams on the River Madeira, and a major new road. According to Brazilian media reports, she was also believed to be dismayed at the recent appointment of another minister to act as a coordinator for the government's newly announced strategy for the Amazon. The government's decision to authorise genetically modified grains, and the construction of a new nuclear power plant, also went against the minister's environmental concerns. Correspondents say Ms Silva's resignation will reinforce a perception that President Lula is more concerned with economic development than conservation. "The environmental area was relegated to no priority," said Denise Hamu, secretary general of WWF in Brazil. "She got tired of the thankless struggle." Others, however, have welcomed her decision to step down. "I hope the next minister is not as radical as Marina. She was an obstacle to economic development in Brazil," said Rui Prado, head of the agriculture federation of Mato Grosso, a big farming state. The child of rubber-tappers from the Amazonian state of Acre, Ms Silva was illiterate until the age of 14. She worked with the rainforest activist Chico Mendes, who was murdered nearly 20 years ago, and she was appointed environment minister when Lula won the presidency in 2002.